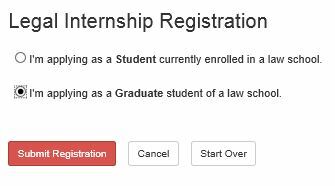 Once registered, you will log in and then choose apply for “Legal Internship” from your home screen. Choose between "Student" and "Graduate"
You will then go to your "Home Screen"
Click "Continue" to proceed with the application. 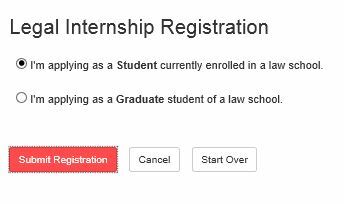 Once the application is complete, you must download the "Student Supervising Attorney PDF" and take it to your Law School for signatures. After document is signed and completed by the Law School, you must upload the signed document here in your "User Home"
Once the application is complete, you must download the "Graduate Supervising Attorney PDF" and take it to your supervising attorney. After document is signed and completed you must upload the signed document here in your "User Home"